I absolutely was in love with your book from the minute I read the preface. It was action packed throughout the whole book. My heart was racing until the very last page. I would like to thank you for writing this book and giving me an excitement to want to go to class every day. “Middleworld”, was a very intriguing book, which relentlessly kept me on the edge the entire time I was reading it. I couldn’t read it fast enough! It taught me things I would die of boredom reading out of a text book. You did something most authors can’t accomplish, sure you filled a book with tons of facts, but you left out the boringness of the facts and brought amusing, charismatic, adventure instead. Your Book, “Middleworld” was an entertaining read; it kept my eyes peeled and my heart racing. Thank you for giving me my new favorite book. 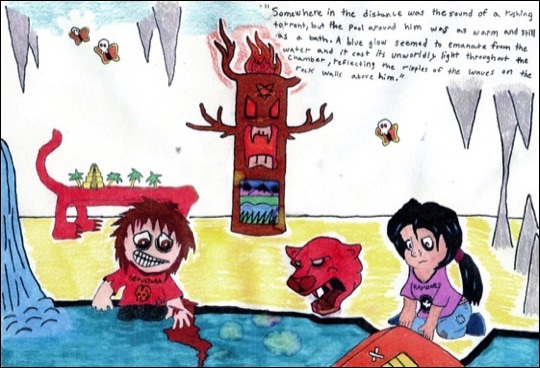 Jon grew up in Latin America, so the book was always going to be set in that region. When he produced his first draft, the pyramids were originally just a cool background for the action. As we started to research the people who built the pyramids, we got sucked deeper and deeper into this fascinating culture until the Maya took over the book. What’s particularly exciting about studying the Maya right now is that there’s still so much the experts don’t know. There are thousands of pyramids still to be excavated, and the archaeologists are making new discoveries all the time. It’s thrilling to be a part of that, even in a small way. The Jaguar Stones as a story was inspired by Jon’s wild childhood growing up in Central and South America. The character of Lola came out of a bedtime story he used to tell the children, called The Monkey Girl. She lived on a pyramid, her best friends were monkeys and every night she would outwit some different bad guys. The jaguar stones in the books were partly inspired by a jade carving that was found in a tomb at Altun Ha in Belize. This volleyball sized head is carved out of a single piece of jade and is the largest jade object ever discovered in the Maya area. Its crossed eyes, fangs and the ahaw glyph on its forehead identify it as a representation of the Maya sun god Kinich Ahaw. In our books, the five (fictional) jaguar stones embody the key pillars of ancient Maya society: agriculture, astronomy, creativity, military prowess, and kingship. San Xavier is a fictional country based on present-day Belize. We chose Belize, because almost everyone there speaks English. Many people also speak a Maya language and/or Spanish. Each of the five pyramids is based on a different real-life Maya pyramid. The Temple of Chahk (Red Jaguar Stone) is based on the Pyramid of the Magician at Uxmal, the Temple of Ixchel (White Jaguar Stone) is based on El Castillo (and the Cenote) at Chichen Itza, the Temple of Itzamna (Blue/Green Jaguar Stone) is based on the Temple of the Inscriptions at Palenque and the Pyramid of Ah Pukuh (Black Jaguar Stone) is based on Temple 1 at Tikal. The Temple of K'awiil (Yellow Jaguar Stone) is the only one not really based on a specific pyramid. However, the castle it is placed in is based on a combination of castles we visited on research trips to Spain for book two. 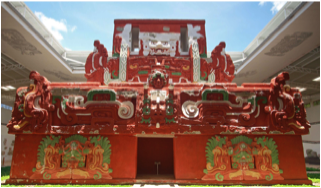 The temples are named after the gods from ancient Maya mythology. 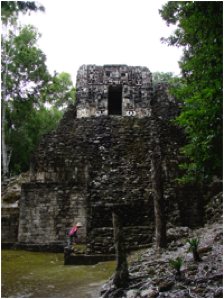 There are quite a few Maya temples/pyramids that have spooky secret passageways, hidden tombs and even ones with twisting dark labyrinths. Temples in the Rio Bec region are often entered through huge scary monster mouths. And the Maya did build pyramids one on top of each other (as described about Ah Pukuh) like the layers of an onion. Archaeologists often dig between these layers discovering tombs, hidden artifacts and amazing carvings still covered in their original paint. What we put into the pyramid of Chahk and Itzamna - the weather control table and the time machine - are not real. However, archaeologist Bill Saturno has just discovered a room in a pyramid at Xultun where ancient Maya astronomers tracked the planets, calculated time and projected a range of calendars. This is the same concept as the time machine room at Itzamna, but using human calculation, not a machine. The pyramids in the books are ruins and just like the pyramids in Central America today, the color on their surfaces disappeared long ago. We do imagine that the pyramids in the books were painted the color of their matching stone. In fact, most ancient Maya pyramids were brightly painted - (usually red with accents of other color). Xibalba is the K’iche Maya name for the underworld and means “well of fear”. In Maya mythology the underworld was a cold and damp place. It is described in the Popol Vuh as a court ruled by the Lords of Death. The Mayan words we use in the book are all actual Yucatec Mayan. The Maya are a fascinating people and we've enjoyed learning about them. 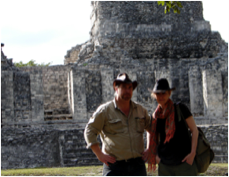 First of all we read every book on the ancient Maya that we could lay our hands on. Then Jon did a course at Harvard on reading and writing Maya glyphs. But our most important research has been the many trips we've made down to Belize, Guatemala and Mexico, where we’ve talked to contemporary Maya people, canoed underground rivers, tracked howler monkeys, explored cave systems and visited about 40 ancient Maya sites. We also attend conferences where the leading Maya archaeologist present their latest discoveries. The writing and illustrations for Book 3, ”The River of No Return”, are completely finished and it's in the publisher's hands now. It will be out in September. For a sneak peak of some of the illustrations click here. No, the Jaguar Stones books are the first books we’ve written. Fingers crossed! We'd love to have the film be made into a movie - and while we have had a number of approaches from production companies, we haven't seen any contracts yet. We do think it would be better to sell the rights after the last book comes out so that the film makers would know where the story is going. There will be a number of big surprises along the way. Do you think it should be animated, or live action? It’s been a lot of fun working together and we make a good team. Where most writers have to argue things through with the voices in their heads, we get to argue out loud with someone who knows the characters every bit as well as we do. At first we’d switch off and pass the manuscript back and forth between us. Now Pamela does most of the writing and Jon does most of the illustrating, but we plot everything together. We like to challenge and surprise each other, and we hope that comes through in the story. There are times when we argue about it, but we can usually find a solution that makes us both happy – and that neither of us would have come up with individually. Many cultures identify butterflies with the spirits of the dead and, in Middleworld, the yellow butterflies are the souls of the ancestors who help Max and Lola in their fight against evil. If you ever go to the Yucatan, you are almost sure to see a cloud of Orange Yellow Sulphur butterflies - they're one of the most common and most beautiful butterflies of Central America. The snake Max meets in the book is the fer-de-lance (Och-Chan in Yucatec Mayan). It’s a highly venomous and aggressive pit viper and causes more deaths than any other snake in South America. It can kill with just one bite. The hologram of Lord Muan took the three stones that Hermanjilio/Tzelek had used on top the Black pyramid - the black jaguar, the green jaguar and the red jaguar stone. That’s an intriguing idea. They are actual characters. However, you never know when a Death Lord might disguise themselves as someone else. He is unaware, until Tzelek takes over. Why have the Maya gods chosen Max? Where is the yellow Jaguar Stone? What happens to Lady Coco and Lord 6-Rabbit? Will Tzelek rule the world? Will Tzelek be defeated by Max? Will Frank Murphy and Uncle Ted stop hating each other each other? Will Lucky Jim get out of Xibalba? Who was this girl that influenced Uncle Ted to stop painting? What happened to the girl? What was the background of Lucky Jim? Why does he want to be so detached from the Maya? And does he have royal lineage? What happened to Uncle Ted’s lost love? I would really enjoy knowing more about Lola’s past? What happened to Lola’s parents, and who are they? Will Tzelek ever come out of Hermanjilio Bol? Will Ah Pukuh ever come back to harm Max for surviving his temple? Why is Count Antonio De Landa obsessed with Lola? Will Max end up with Lola?